The holiday season is here and it’s time to begin decorating. 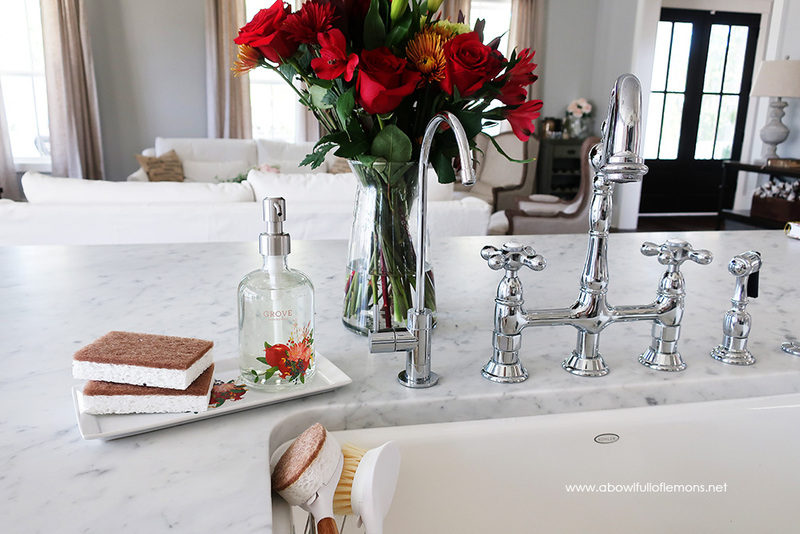 I want to help you get started by offering a fabulous FREE limited edition kitchen sink that will add a little touch of festive color to your space. 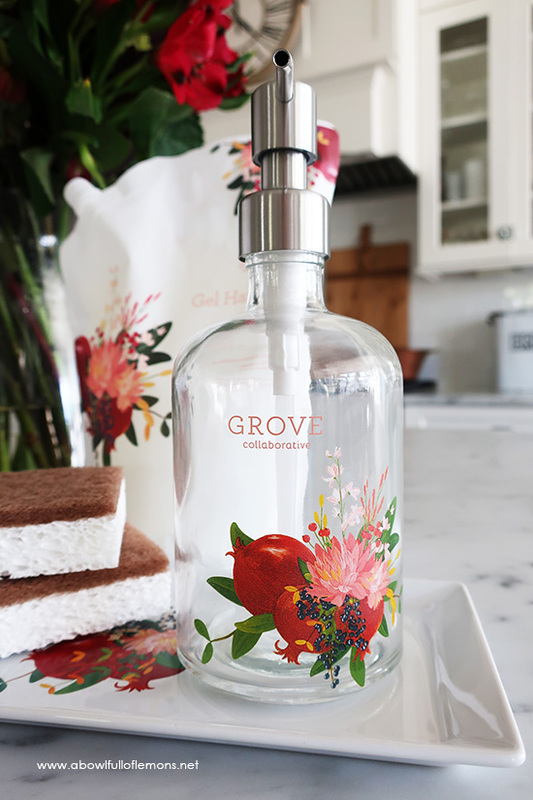 If you haven’t tried Grove Collaborative yet, this is a great way to try out their products. I have been ordering all of my cleaning products from Grove for years. They are an amazing company who thrives on great customer service. If you have any questions, don’t hesitate to ask. The current LIMITED EDITION offer just for A Bowl Full of Lemons readers is a festive pomegranate kitchen sink set. Right now, you’ll get all of this for FREE! 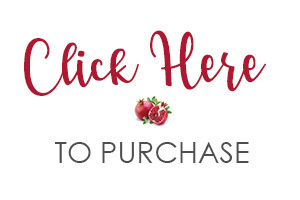 **When you place your first order of $20 from Grove by using my link! Existing customers will receive FREE Grove walnut scrubber sponges. 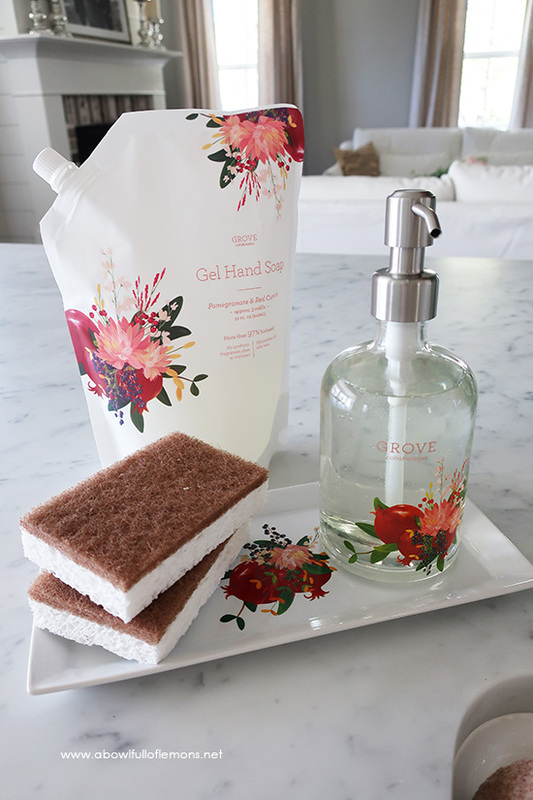 This imited-edition Pomegranate & Red Currant Gel Hand Soap is the perfect set to display in your kitchen for the holidays. 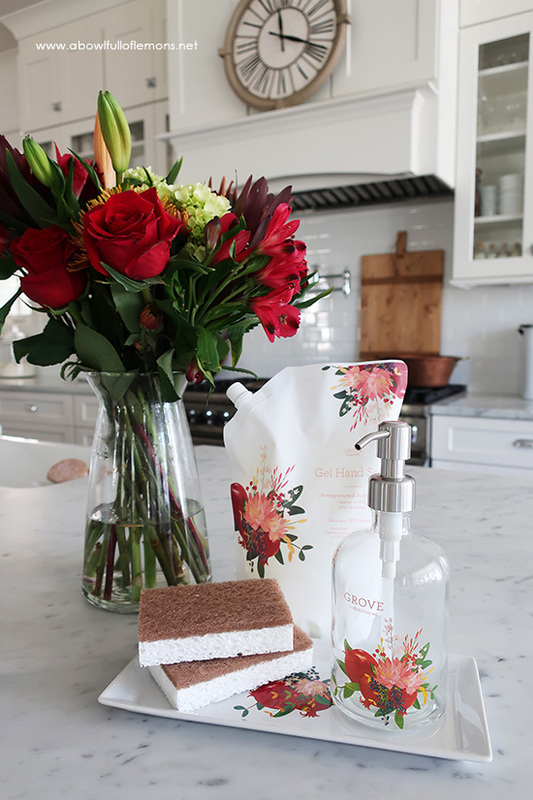 With notes of vibrant red fruits, citrus and cinnamon, it’s the perfect subtly, spicy-sweet fragrance for the season. 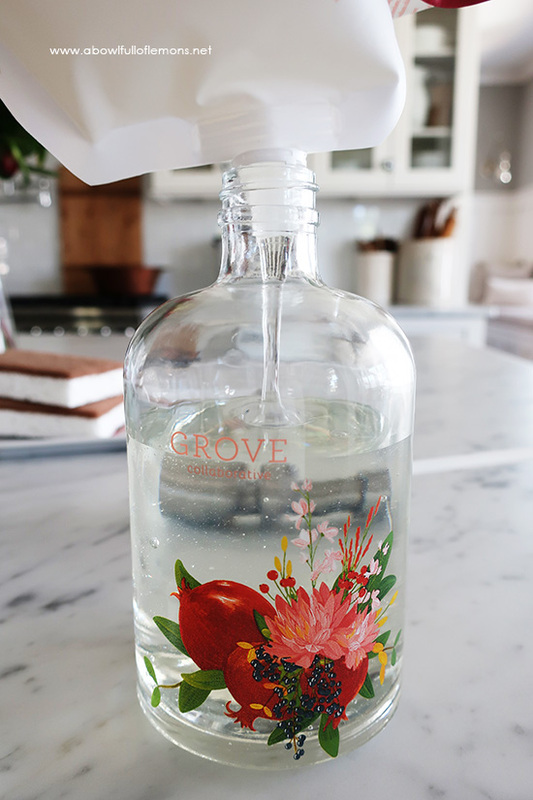 Pair this refill with the matching, limited-edition Grove Glass Hand Soap Bottle to give your hand-washing routine a festive upgrade while reducing packaging waste. Natural fragrance — not synthetic. High-foaming but never drying, with added aloe for moisture. 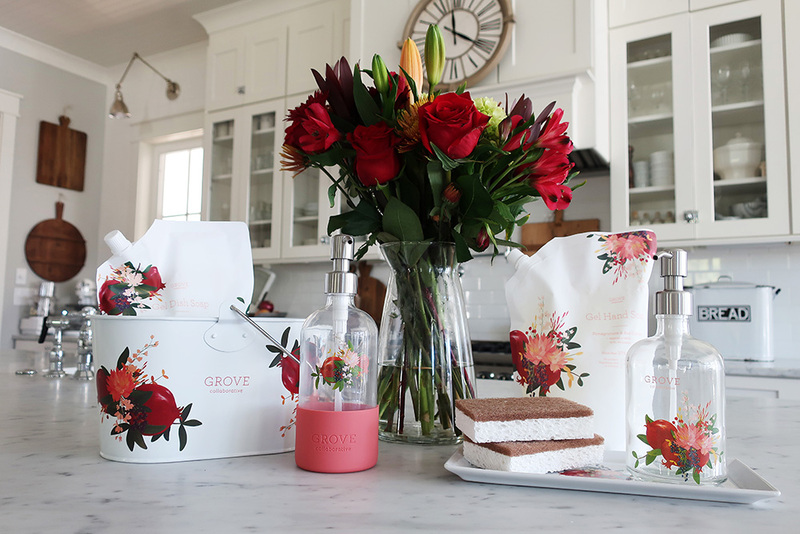 The refillable glass bottle is a perfect way to experience all of the amazing Grove scents to throughout the year. Plus, if you spend $39, you’ll also receive a free Grove cleaning caddy — perfect for keeping your supplies organized and within reach! Be sure to check out all of the Pomegranate line. Don’t miss out on this fabulous limited edition kitchen sink set.